Giles Dexter Harlow, Jr. passed away on November 20, 2012 at Walter Reed National Medical Center from complications from Parkinson's disease. Giles was an early and enthusiastic member of the West Point Alumni Glee Club. A proud member of the West Point Class of 1957 he was an Air Force veteran. 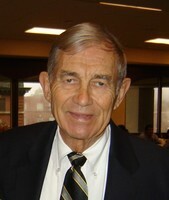 His service will be on Saturday, November 24th, 2012 (time TBD) at St. John's Episcopal Church, 6715 Georgetown Pike, McLean, VA, 22101. He will be interred in Claryville, NY. In lieu of flowers, the family has requested that donations be made to the Wounded Warrior Project, Inc.